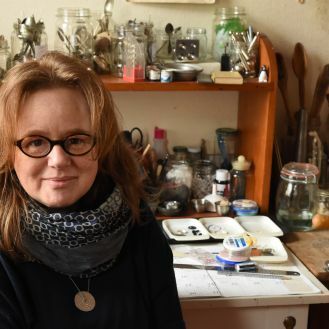 Jeweller Victoria McIntosh is used to watching people’s jaws drop when they first lay eyes on her jewellery. A keen op-shopper and lover of vintage materials - including teaspoons and cheese graters - McIntosh lets her vintage discoveries shape the direction of her work. McIntosh’s jewellery is sometimes and wearable and sometimes not, and she likes it that way. The small sculptural items submitted for Shanghai are a statement on the body-obsessed age we live in, where more than ever women are pressured to look a certain away, and retain their youthfulness eternally. ‘‘I was looking very much at the body: how jewellery adorns the body and the body as a subject,” McIntosh told the Otago Daily Times. 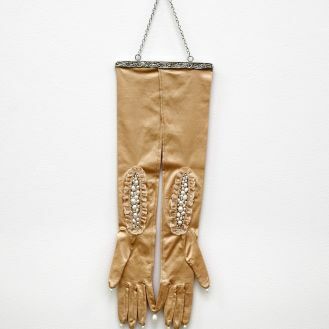 The sculptures submitted to Shanghai make use of a plethora of luxurious vintage fashion items, including pearls, a vintage mirror, gloves, knicker fabric, fashioned and repurposed to spark reflection on the length of time women have been primping and preening throughout history. McIntosh’s intriguing pieces weave themselves between the often blurred boundaries of art and craft. A self-professed “hoarder”, her studio in Dunedin is a visual feast for visitors, crammed full of seemingly unrelated vintage materials, old exhibition posters and even a Kayak. Friends and family often gift McIntosh their choicest finds from op-shops, knowing she’ll repurpose them in new and interesting ways. In 1991 McIntosh studied printmaking and bookmaking at Otago Polytechnic , and moved north to Auckland where she apprenticed as a bookbinder for two years. McIntosh then worked as a picture framer and barmaid in various cities around the world, before returning to Otago Polytechnic to study jewellery-making in 2005. Moving into her studio nearly a decade again was a catalyst for settling down to explore the creative discipline that has somehow managed to combine her many talents and loves.